Speaking of the Vanguard podcasts, I listened to this episode released in April: The Roth IRA: An effective estate planning tool? Diane Streleckis: And what about gifting with a Roth, does that make sense? Maria Bruno: If you make the decision to do annual gifting, if the donee actually has earned income, you can make the contribution for the donee. So, for instance, if you want to give annual contributions to your children, as long as they have earned income, you can make the contribution to his or her Roth IRA. And the cap is $5,500 for 2016, assuming the donee’s under age 50. But that’s one way to gift assets while using the annual gift-tax exclusion. Is that right? Can you gift to someone else’s Roth IRA? $5,500 per adult child under 50, as long as they have earned income? Grandkids, brothers and sisters, nieces and nephews too? Note: Those are income limits for 2015. The limits are slightly higher for 2016 and 2017. The contribution limit for Roth IRAs generally depends on whether contributions are made only to Roth IRAs or to both traditional IRAs and Roth IRAs. However, if your modified AGI is above a certain amount, your contribution limit may be reduced, as explained later under Contribution limit reduced. Roth IRAs and traditional IRAs. If contributions are made to both Roth IRAs and traditional IRAs established for your benefit, your contribution limit for Roth IRAs generally is the same as your limit would be if contributions were made only to Roth IRAs, but then reduced by all contributions for the year to all IRAs other than Roth IRAs. Employer contributions under a SEP or SIMPLE IRA plan do not affect this limit. The income limit and the contribution limit are both on the IRA owner. There is no separate provision for contributing on someone else’s behalf (other than the spouse). So the answer in the Vanguard podcast missed two big caveats. 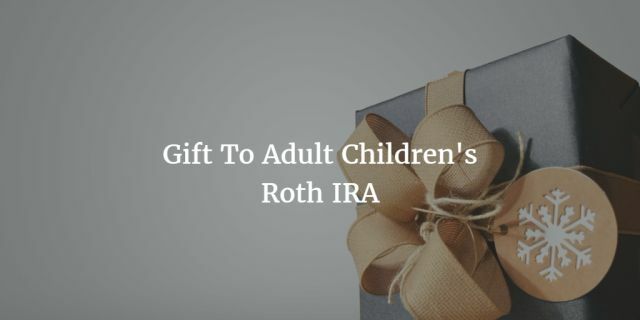 For “gifting with a Roth” to work, the recipient must have enough compensation, be under the income limit, and not have already used up the IRA contribution limit him- or herself. If you intend to contribute to someone else’s Roth IRA for wealth transfer across generations, it only works if they are eligible but they won’t contribute or they won’t contribute the maximum otherwise on their own. You can’t do it if they are not eligible to contribute in the first place. If they already contributed the maximum themselves, you can’t do it again. And can I throw out a twist on the idea that some small business owners may want to consider? If you’re employing your kids in your own business, rather than gift money, you may want to just pay them enough that they can make their own IRA or Roth contributions using their earned income. That’ll mean the extra your small business pays actually becomes a tax deduction on your return… and possibly the child won’t pay income taxes if his or her income is low. Kids, maybe. Adult children may want to do something on their own. Thank you for this good information! In my research I have found that my adult daughter (who is a homemaker) can set up a ROTH IRA for herself based on her husband’s earned income (a spousal IRA). My brokerage tells me that ONLY the spouse can contribute to this IRA, but I have read elsewhere that parents can contribute to an adult child’s ROTH IRA as well. So, I believe I could send her money to put into the ROTH (within limits of his earned income of course). But, what I would like to do is to contribute directly to this ROTH IRA myself on a regular basis as part of a wealth transfer process versus sending her the check to do it. What do you know about this specific scenario? I think the point of the Roth IRA gift was missed. Obviously, contributions without permission could be a bad idea. Gifting money to grandkids earmarked for retirement accounts is great because it reinforces a habit, and the money will likely be spent on something meaningful in the distant future such as spending on subsequent generations rather than the typical Christmas cash. I am interested in how this strategy could impact college efc compared to other strategies. Agree – If my parents essentially “paid my Roth bill” each year, I could use that extra $5,500 to invest elsewhere.